WORTHING Football Club are close to finalising their squad for the upcoming Ryman League South Division season. After Saturday’s two 70-minute friendlies against Horsham and Burgess Hill, Rebels released trialists David O’Callaghan and Sibu Muwanga, while defender or midfielder, Will Berry, has also left the club. Another trialist, Matt Axell, signed for the club on Tuesday evening after the friendly with Lewes. Rebels joint bosses Gary Elphick and Jon Meeney are also hoping to keep young defender Calvin Crooks, who played against Horsham and Lewes, and was with Eastbourne Borough’s youth team last season. Two trialists from Havant & Waterlooville, Liam Kimber and Jake Gale, also played for Worthing on Saturday and Tuesday and Rebels are looking to keep both involved with the squad. Striker Ben Pope has been on trial at Premier League Bournemouth and scored twice for their under-21 team in a friendly on Saturday. Elphick said: “We’ve got to use our budget effectively and we’ve got to think that we might need something financially to get a replacement for Ben, or someone in on loan, if he gets something at Bournemouth. “We’ve let Will, David and Sibu know now, so that they can find another club in pre-season but we thank them for all their efforts with us. “Hopefully, we’ll tie down Calvin as he’s a player who has a lot of potential and I’ve been told he’s a like-for-like replacement for Jack Cook. Pope was on trial at Stoke, Norwich and Cambridge last season and Elphick admitted he has spoken to his brother, Tommy, Bournemouth’s captain, about Rebels’ young striker. He said: “Ben’s a fantastic player and a great young lad. “He deserves everything that happens to him. He’s with Bournemouth this week and will play two or three games for them. “Bournemouth were keeping tabs on him last season but my brother rang me up to pick my brain about him and it was nice to be able to speak so well of him. On any more signings, Elphick said: “We’ve got to get the balance right in terms of bringing more players in, as there’s a conveyer belt of talent in our youth squads here. Striker Tony Nwachukwu is two weeks’ away from featuring for Rebels. He has missed their pre-season friendlies so far with a slight stomach strain. Rebels lost their two 70-minute friendlies 1-0 to Horsham and then 3-2 against Burgess Hill at Woodside Road on Saturday. Berry and Jack Barnes were on target against Hillians, who drew 2-2 with Horsham in the other match. 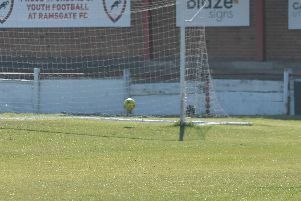 On Tuesday, Worthing went down 1-0 at home to Lewes, who scored after just six minutes. Rebels host Woking on Saturday (1pm) and then entertain Bognor Regis on Monday (7.30pm).